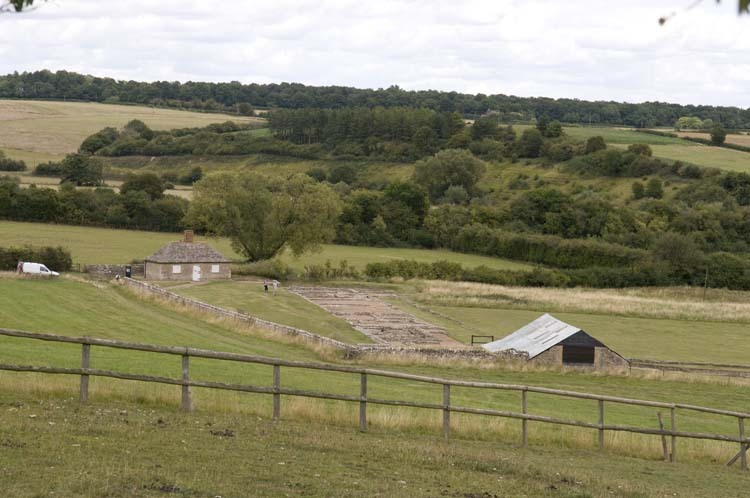 The site of North Leigh Roman Villa, located within a loop of the River Evenlode. This was a 'courtyard villa', having a range of buildings on each of three sides of a rectangle, with a corridor and gatehouse closing the courtyard on the fourth side. Significant finds of pre-Roman Iron Age pottery and other features beneath the former south-west range show evidence of earlier occupation, and it is known that the development of the site was lengthy and complex. The Iron Age settlement was superseded by the first Roman development in the 1st or early 2nd century AD. This phase consisted of three buildings along the line of what was to become the north-west range, one of which was a bath-house. Another structure served as a linking corridor. Early in the 3rd century were added the south-west and north-east wings, partially enclosing the courtyard. These wings were later extended and the original north-west range entirely rebuilt, probably in the early 4th century. At this stage the villa incorporated 4 bath suites, 16 mosaic floors and 11 rooms with under-floor heating. Aerial photographs have revealed that there were further buildings beyond the south-west range – perhaps including an aisled barn or hall – which may have formed a home farm for the villa. The villa was abandoned when the Romans withdrew from Britain in the 5th century. North Leigh ranks among the larger villas of Roman Britain. A few of these villas may have been the residences of Roman officials, but the majority are now thought to have been the homes of leading members of the native population who were co-opted into the empire and rewarded with lavish buildings and a superior way of life. The architect Henry Hakewill excavated the ruins in 1813–16. Professor Francis Haverfield conducted further excavations in 1910 and finds suggest that there were at least three phases of construction. Aerial archaeology in 1943 photographed the previously unknown plan of the southwest wing. 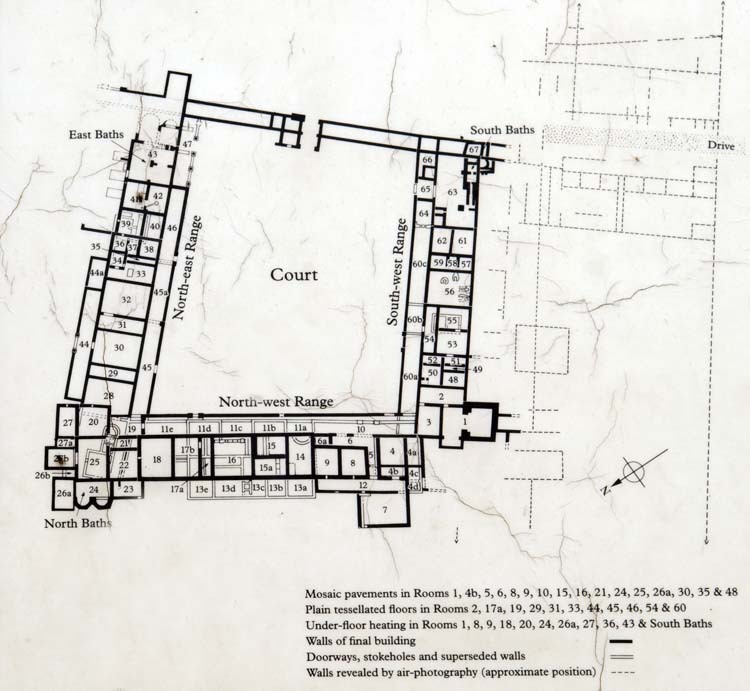 Excavations for the Ministry of Public Building and Works in 1958 revealed several phases of occupation and development, starting with Iron Age postholes indicating that the first buildings on the site were wooden. The ruins were further excavated in the 1970s. The main courtyard villa building complex measures about 65 by 50 metres and it has three ranges of more than 60 rooms built on three sides of a courtyard. The fourth side is formed by a corridor in which the gateway was set. There were further ranges of buildings to the south west of the main complex, either side of a metalled driveway which led away from the gateway on the south eastern side of the courtyard. Aerial photography has also indicated the presence of workshops and other buildings extending over a large area on the west bank of the River Evenlode. It is noted for the 3rd century mosaic floor displayed on the site. The shed over the mosaic floor is one of two built by the owner of the site, the Duke of Marlborough, following excavations between 1812 and 1814 and after two other mosaics had been destroyed by souvenir hunters.